Cramer & Anderson Senior Partner Ken Taylor will be spending two days a week in the firm’s new office in Ridgefield, bringing his compassionate, constructive approach in several Practice Areas to clients across Fairfield County. In this approach, an attorney represents each of the partners but both agree to work toward a resolution collaboratively and without resorting to court. The process begins with the couple sitting down with the attorneys and working out mutual goals. “It’s generally a very good process,” said Attorney Taylor, who has been professionally trained in collaborative divorce. “What it does is avoid the long-term scars for a family because you work on resolving their issues together.” Collaborative divorce can also protect assets and save clients money. Attorney Taylor is a member of the Collaborative Divorce Group of Western Connecticut and The Litchfield County Collaborative Divorce Group. The western Connecticut group consists of a wide range of professionals that includes therapists, psychologists and divorce financial planners. 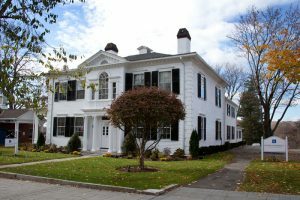 The building at 38C Grove St. in Ridgefield, where Cramer & Anderson’s new office is located. “We are dedicated to helping individuals and families resolve their divorce in a respectful, cooperative and cost effective manner without court intervention,” the western Connecticut group’s website explains. 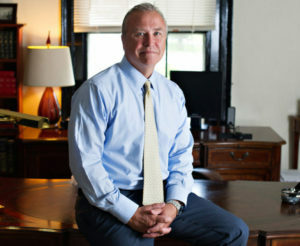 Attorney Taylor will be in the Ridgefield office, located at 38C Grove Street, on Tuesday and Friday. He may be reached by phone in the Ridgefield office at (203) 403-4005, and by email at ktaylor@crameranderson.com. He may also be reached by phone in the New Milford office at (860) 355-2631. In addition to the new Ridgefield office, Cramer & Anderson also has offices in New Milford, Danbury, Litchfield, Kent and Washington Depot. For more information, see the website at crameranderson.com or call the New Milford office at (860) 355-2631.